In the ancient mystery schools there was always an inner and outer teaching, i.e. the esoteric and exoteric teaching. The innermost esoteric teaching was known as the Light and Sound – the inner sound or Word (Logos) of God. This esoteric corpus is clearly identifiable as the core of the mystery teachings in the Gospel attributed to St. John the Apostle. This Gospel commences “In the beginning was the Word” (Sound), and the writer then goes on to mention the Light, which is clearly secondary, as an outworking or effect of the primary Divine Cause which in Greek is called the Logos or Divine Word, a universal Sound Current which is at the heart of all creation and sustains all Life. In his enlightening book Yoga and the Bible (1963), Joseph Leeming quotes the first verse of the Gospel according to St. John: ‘In the beginning was the Word, and the Word was with God, and the Word was God‘. and comments: “These moving and meaningful statements made by St. John in describing the Divine Word of God are among the best known in the entire New Testament. But it is safe to say that their true meaning is one of the least known of all facts in the entire teachings of the Bible…. The Word of God is, and always has been the most important factor in the teaching of the Masters-of the teachings of Jesus as well as of the Masters of today. It is mentioned under different names in the scriptures of all the great world religions, though its meaning has been known to but few of the followers of these religions. The Hindu scriptures call it Anahat Shabd, or the Unstruck Music, and also Akash Bani, the Celestial Voice. Mohammedans call it Kalma, or Word, and Kalam-i-Ilahi, or Voice of God. Zoroaster speaks of it as Sraosha, meaning ‘the Sound from the Sky.’ The early Greek philosophers who had learned the spiritual secrets of India, refer to it as the Logos, while some called it the music of the spheres. Socrates speaks of it as an inner sound that transported him to realms of transcendent and divine beauty. The Masters of today call it Nam, meaning Name or Word (of God); and also Shabd, which means Sound, or more particularly, spiritual Sound. In the English language the Word is called the Sound Current or the Audible Life Stream…. Joseph Leeming continues: “The great Masters of all ages have all taught the same doctrine, the identical method of freeing the soul from the fetters of mind and matter and of entering the kingdom of heaven while still living on earth in the physical body. The Way that was taught by Jesus to his closest disciples is the Way that is taught today by the perfect living Masters. The Way is called here the path of the Masters or, because it is a scientific method of achieving continuous and certain spiritual progress and successively higher states of consciousness, it is called the spiritual science of the Masters…. The spiritual science or yoga of the Masters, the doctrine of Him who sends the Masters to this world, is the supreme science of all sciences, for it deals with the ultimate truths of man’s nature and destiny, and the ultimate purpose of all human life. It teaches the student, by a method of guided scientific experimentation, how to make direct and permanent contact with his Creator. It is a science based on laws which, though they have always existed, are not generally known. And it is the greatest of all sciences, because it turns ordinary mortals into divine beings…. No blind belief or blind faith is called for when one is following this path. As the student follows the instructions given by the Master at the time of initiation and subsequently, he obtains through his own inner experiences definite proof of his spiritual progress and positive confirmation of the truths enunciated by Jesus and all other great spiritual teachers. The Light and Sound teachings were taught by Pythagoras, Plato, Socrates, Lao Tse, Jesus the Christ, the Sufi sages, Rumi and Hafiz, the Indian saints Kabir and Nanak, and more recently the 19th and 20th century Light and Sound Masters in India, including Sawan Singh Ji and Charan Singh Ji. Currently, the Light and Sound teachings are being taught in the West, under the name MasterPath, by Sri Gary Olsen, an American of Swedish descent. An objective investigation of the MasterPath teaching clearly reveals the present continuity of the Living Master tradition. Indeed, the close parallels between the recorded true teachings of Jesus the Christ and Sri Gary Olsen are remarkably striking. In fact, the core essence of both teachings are identical, revealing the one Divine spiritual truth which is consistent throughout the ages via the spiritual teachings of the true Light and Sound Living Masters. Sri Gary Olsen writes: “The greatest detriment to most seekers can be summed up as a misunderstanding of the return of the Messiah, known as the second coming of Christ to the Christian, the return of the Maitreya to the Buddhist, the Lost Word to the Masons, or the Missing Tablet to the Hopi Indians. These groups all view this transcendental prophecy as an event that transpires at the end of this world, or a phenomenon that happens within time and space on this plane of action…. The spiritual seekers of today, whether they embrace the Bible, the Koran, the Bhagavad-Gita, the Upanishads, the Talmud, the Shastras, or even the Adi Granth, are all following deceased Masters. Sustenance cannot be received from a dead Master any more than an infant can receive nourishment from a dead mother.” Clearly, as potential disciples, living human beings require a living master to instruct them, as opposed to dead or ascended masters who are unable to properly communicate the Divine spiritual truth to them. Sri Gary Olsen further observes: “The world is never without a Living Master, though He may escape the public eye. There is always a Living Master present who has been chosen to represent and instruct those presently incarnated souls who have readied themselves through past efforts. When the student is ready, the Master will appear. You will be contacted through a book, friend, vision, dream, or some other avenue especially designed for you. Divine law demands that when the seeker is ready to hear about the Light and Sound Teachings, in whatever age, country, or body one finds oneself, one will be approached in some manner and informed of the upcoming journey…. “Great music is faintly heard; Great form has no contour; And Tao is hidden without a name. It is this Tao that is adept at lending (its power) and bringing fulfilment. “The voice of God is coming into my (spiritual) ear like an echo. Christian O’Brien continues: “On the Mount of Olives, in the weeks after his Crucifixion, Jesus was preparing for his final departure from this World. He had selected twelve men, and a number of women, to form his Inner Circle of Disciples. These Apostles, as they became known, had to be taught the Spiritual Truths in the greatest detail, and had to be shown the secrets of the Higher Spiritual Planes, so that they could be deemed ‘Saints’ and be capable of continuing his work on Earth after his departure…. This esoteric knowledge, which was the real substance of Jesus’s Teachings, is stated, in this record, to have been taken down, word by word, by three disciple-scribes-Philip, Thomas and Matthew…. Jesus stated: ‘Listen Philip, you Blessed One. It is to you that I have said these words, because you and Thomas and Matthew are the hands to which it is given-by the authority of the Supreme Being-to write down all the words that I shall speak, together with all the things that I shall do; and everything that you will see’…. Writing in the 21st century, Sri Gary Olsen says: “There is a vast difference between what Jesus Christ literally stated and what the religious historians have attributed to Him. There is equal disparity between what Jesus Christ actually meant and what has been interpreted through the minds of religious authorities spanning the past two thousand years…. 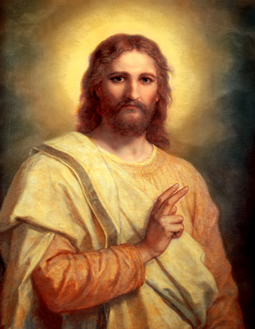 Jesus Christ’s original Teachings were pure, and as a genuine Master of Light and Sound, He expounded on the Light and Sound principles throughout His mission…. There is also biblical scripture which confirms the spiritual mantle being passed from John the Baptist to Jesus, and then from Jesus to Peter, verifying the Light and Sound principle that there is an ongoing line of Masters, and that there is always at least one true Master present in the world. Jesus confirmed this same principle in part when He said, ‘As long as I am in the world, I am the light of the world,’ clearly suggesting that His divine mission lasted only as long as His earthly incarnation. Regarding the principle of reincarnation, Jesus made it lucidly clear while talking to His disciples that Elijah had returned, and was now known as John the Baptist. Any logically thinking individual can surmise what this literal statement means. Dr. Julian Johnson, a former American surgeon, and Initiate of the Light and Sound Master, Maharaj Sawan Singh, goes on to record his personal experience of meeting this Saint in India: “For years and years I wished I might have been with Jesus when he was on earth, to have been his disciple, following him over those Judean hills and down to Galilee and Jerusalem, watching his gracious ministry and, if possible, giving some loving service. Often in years long passed, the thought haunted me day and night. But never did I imagine it would be my good fortune to have that wish gratified in substance. But now I have only to transfer the scene from Palestine to India and change the date, and in this good year of 1933 I am walking daily by the side and sitting at the holy feet of the great living Master…. “Today I feel a sense of pity for the masses who do not appear to realize what a priceless privilege might be theirs. They are letting the golden opportunity slip by them. They do not seem to understand now, any better than they did in the days of Jesus, that a great Master is among them. They are so blinded by the god, or gods, of this world that the great light which now shines among them is quite invisible to them. Truly the light is shining into the darkness and the darkness does not comprehend it. Perhaps two thousand years from now, many who read the history of our Master may look back with longing and wish they had lived in his day, so that they might have seen him and might have become his disciples. But some of my American friends will say, ‘Yes, but your Master in India is not Jesus. He is only a mere man, while Jesus was the son of God.’ Both of these assertions are due to theological misconceptions. Jesus himself never thought that he was anything above and beyond the possibilities of other men. In fact, he taught the exact contrary. Get the New Testament and read his own words, not the words of Paul, the theologian. There is not a word in the New Testament, except perhaps one or two interpolations, in which Jesus makes any claim to an exclusive, divine sonship. Such a thing was never thought of until long after his death. The following comments by a German former cloistered Benedictine nun, who subsequently was initiated into the Light and Sound teachings in India, support the continuity of the incarnated Christs (the Word made flesh) throughout human history as the true representatives of the Supreme Divinity: “In his human form, however, Jesus Christ could reach only his contemporaries, but not the generation coming before or after him. What about those who had lived outside the short period when Jesus was on earth?… God has to send his Son again and again into the world, so that as a Christ he can show the way back to the Father to those souls that are allotted to him. The Word must take human form, because only in this form can he proclaim the message of the kingdom of God and redeem the souls. If it was necessary once that the Son of God, his Word, should come to earth, then it would always be necessary…. The Masters of the highest order, true Masters like Jesus Christ, are incarnations of the one Word. In this way each Master is universal…. the universal Christ is transhistorical and pre-existent to his incarnation as Jesus of Nazareth. This pre-existence refers not only to his eternal being as the Word of God, but also to his position as a Christ, the anointed one…. In many of his self-testimonies, Jesus Christ transcends his earthly personage, indicating the mystery of his timeless existence, as for instance when he says ‘Verily, verily, I say unto you, Before Abraham was, I am’…. “Jesus revealed himself as the one pre-existent to his birth, as the one who descended from heaven: Verily, verily, I say unto thee, We speak that we do know, and testify that we have seen; and ye receive not our witness. If I have told you earthly things, and ye believe not, how shall ye believe, if I tell you of heavenly things? And no man hath ascended up to heaven, but he that came down from heaven, even the Son of man which is in heaven. On many pages of The Gospel According to Saint John, we can read similar self-testimonies of Jesus Christ. His most important statement is probably: ‘I and my Father are one.’ In another instance Jesus says: ‘No man knoweth the Son, but the Father; neither knoweth any man the Father, save the Son.’ Even in the face of death, Jesus still testifies that he was in the glory of the Father, which he had with him ‘before the world was’…. Interestingly, there have been a number of theories advanced as to the true nature of the Holy Grail. Is it a cup? Is it a stone? Is it a secret book of hidden knowledge? Indeed, is it an external object at all, or are there internal ramifications? Could there be an inner spiritual dimension to the Holy Grail? Two millennia ago, Jesus the Christ, the then true Living Master in the East, heralded the spiritual wave of the Piscean Age. Now, in the 21st century, Sri Gary Olsen, the present true Living Master, established in the West, heralds the new zodiacal cosmic wave of the Aquarian Age. From their innate true spiritual teachings can be discerned a direct continuity between these two spiritual living masters, as there is with the Piscean and Aquarian zodiacal ages. If God, the Supreme Deity, is infinite, then what can possibly co-exist with God. This would, of course, include human beings. So if humans cannot, and in fact do not, co- exist with the Divine Reality, then what are we left to conclude? Is it any wonder that all the genuine Masters of spiritual truth have proclaimed that the Kingdom of God is within you. What could possibly supersede such an internal Divine Holy Grail? Clearly, Jesus the Christ was aware of this inner Divine Reality with the conscious realisation of His individual spiritual sovereignty: “I am the Way the Truth and the Life”. The only difference between the enlightened Christ and unenlightened humanity is that Jesus knew who He was and we, as yet, do not. The mission of all the true Living Masters has always been to help those souls, who were sufficiently ready to engage in applying the Light and Sound teachings in their lives, to ultimately become truly Self and God realised, being aware of their own innate Christ nature of spiritual Mastery. In contradistinction to what are called the Canonical Gospels or scriptures, within the greater universal Canon of Truth and Righteousness all things are known and all things are revealed according to Divine spiritual truth. A proper study of the Light and Sound teachings reveals this to be so.